I seem to be living in a cloud of pink and white lately. 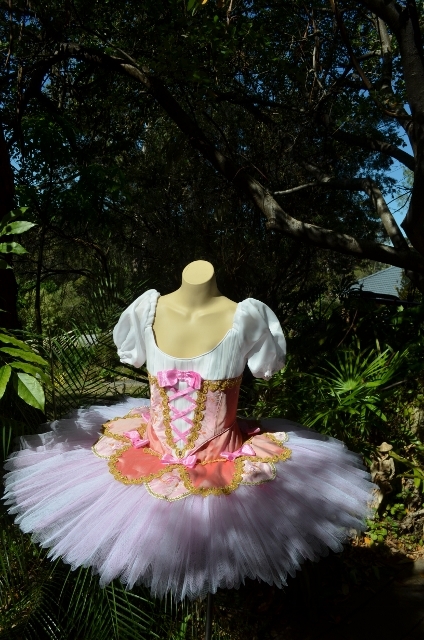 I’m not really a pink person so I called on my inner princess to help with this one for YAGP in January. 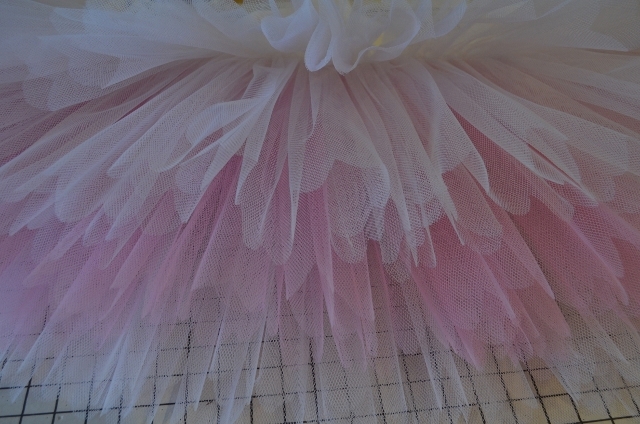 In this Fairy Doll tutu I’ve used 3 quite different pinks; salmon pink, soft baby pink and bright pink. Well perhaps there are four as the salmon dupioni is shot and has two colours depending on how you view it. We started with a few ideas that grew and changed. 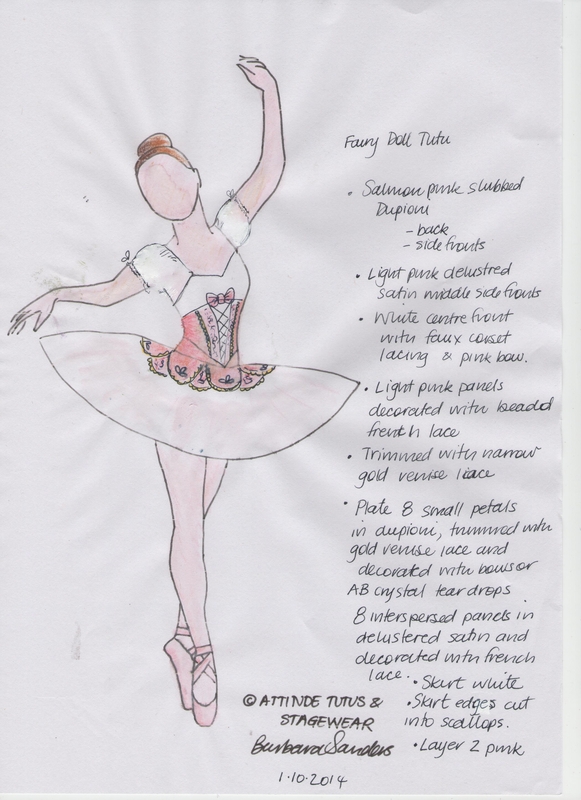 Many Fairy Doll tutus have exaggerated decorations and big puffy sleeves but we decided to keep things relatively low key and just focus on colour and sparkle, but not forgetting the obligatory bows! I made these in bright pink so they would be a focal point of the design. To avoid a pink overdose I decided on a crisp white skirt but with a layer of pink to give the skirt a soft pink blush. The edges of the net was scalloped. I don’t use a template for this because … well, life is too short. I just fold the net 3 or 4 times, secure with a large quilting pin and cut through all layers with shears. 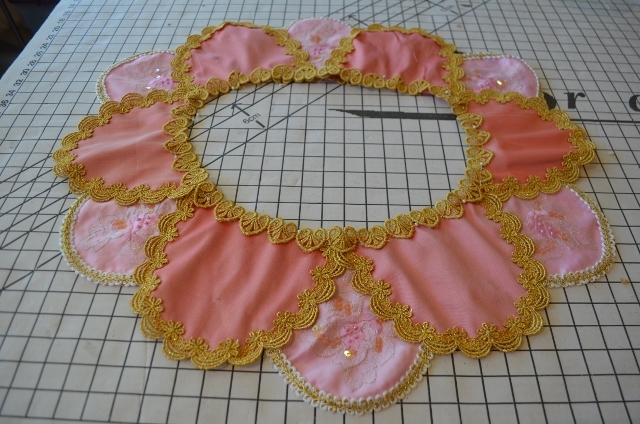 As I tack the skirt I will trim up the occasional wonky scallop. I’m most careful, of course, with the top layer of net as it is most visible. I sew the top 2 layers on seam allowance upwards. This means putting layer 2 on first. Here you can see pink layer 2. 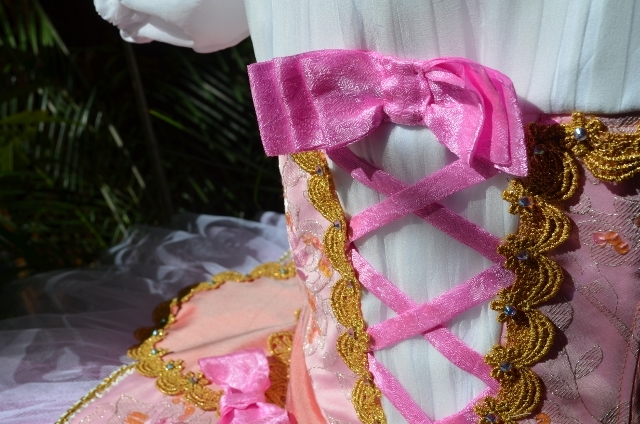 Here you can see my 3 pinks in the bodice. 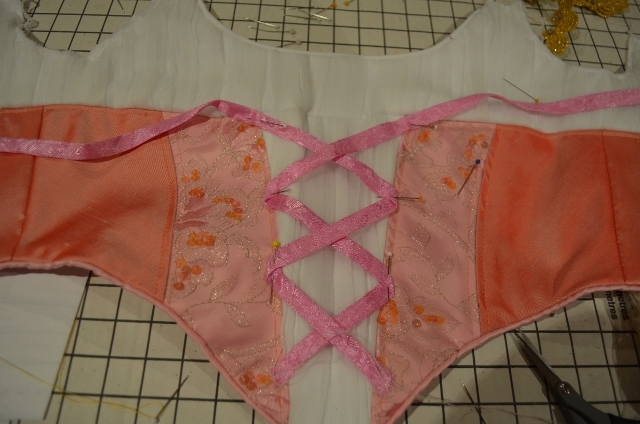 The bright pink really pops as the corset lacing. 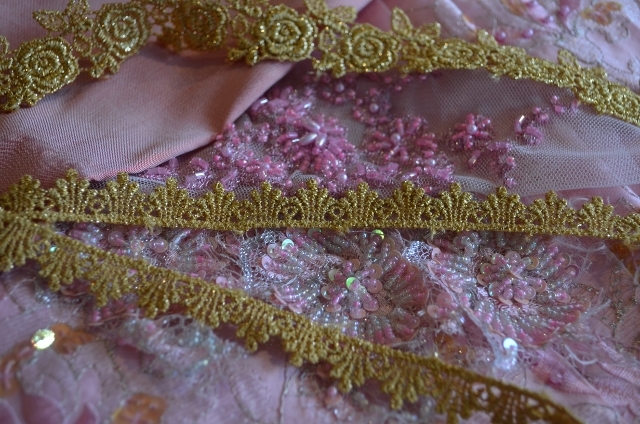 The centre side panels are embroidered taffeta with a few sequins. They show up orange here but are much more subtle than that. I’ve used the ruched bodice effect again here. It’s one of my favourite styles. 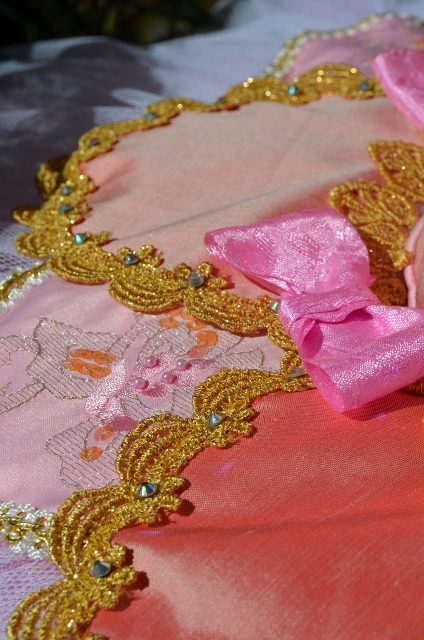 The plate is made up of 12 petals, 6 in the salmon silk and 6 in the embroidered taffeta. Gold venise lace, white and gold braid and AB crystals rhinestones complete the picture. Bright pink bows will adorn the junction of the petals. I have attached little puffed sleeves to the tutu. 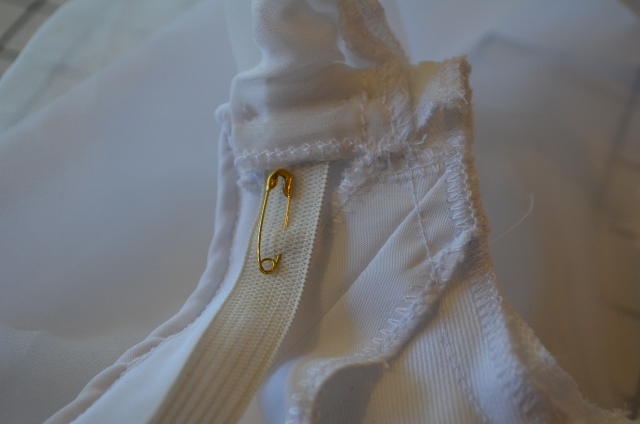 I threaded the elastic through a casing and sewed it securely to the front but have left is adjustable at the back for the dancer to make the final adjustment after she’s danced in it a little. 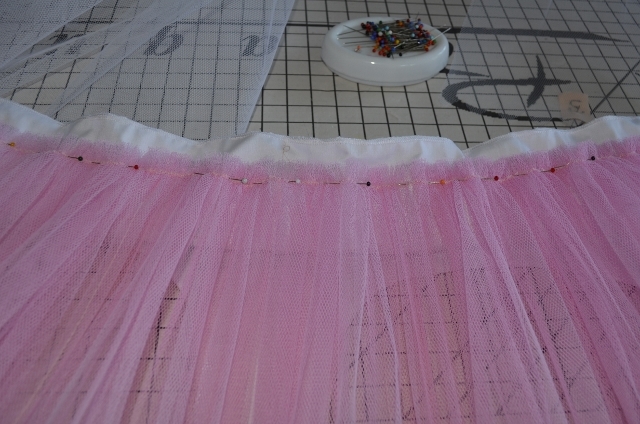 Tutu bodices will stretch a little when warmed up and hooks and bars may need some final tweaking. The bright pink really brings the decoration to life. You can see the dupioni shows up as 2 different colours here. I like daylight photos as they give a a bit of an idea of how the colours will change under stage lights. I think she is quite a sweet confection.